No doubt the Xiaomi Pocophone F1 is the best mid-budget phone powered with the Qualcomm Snapdragon 845 SoC, 6 GB RAM, 64 GB storage, a 4,000 mAh battery. Not only this the development of the phone is good too, and now Xiaomi released the new MIUI 10.3.4.0 update for the POCO F1. Which comes with the Android Pie and updated security patch. Some new features are also added in this new update and most of the bus are fixes in this update. 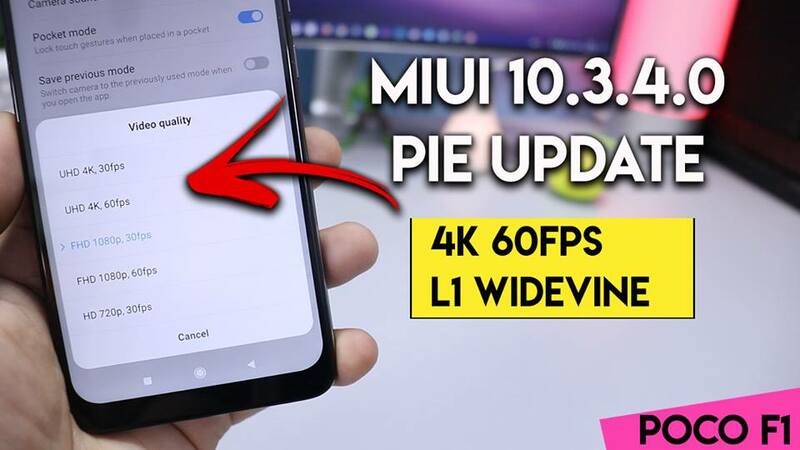 So today here we will discuss how to Download MIUI 10.3.4.0 update for POCO F1. The MIUI 10.3.4.0 update for POCO F1 is already rolled out and many users already go the MIUI 10.3.4.0 OTA update on their devices. If you are still waiting for this update then you can flash this manually with the updater app of your phone. Some major changes in this update are 4K 60FPS Recording, Widevine L1, Game Turbo, and more. So now the POCOPHONE F1 user will enjoy the HD video on online streaming sites. But Netflix still doesn’t support HD playback. Netflix will have to add support for the device, which might take a while. MIUI 10.3.4 Global Stable update adds support for [email protected] fps video recording, game turbo (software tweaks to boost performance in games), a whole bunch of camera updates and several bug fixes. Below are the links which you can download on your phone and update your phone with this new OTA update. This is the Global stable version and not the developer version. March 2019 Increased system security. The process is simple, all you have to download the zip file from the download section and install the zip file with updater app > choose update option. Read here how to install MIUI recovery rom.